Even though we've already seen a theatrical trailer for this, Disney has debuted a new first look photo for Pixar's Toy Story 3 featuring the entire cast (via Moviefone). It's just about everyone you'd recognize, but there aren't any new characters in it. In fact, it's pretty much the main cast and that's it. I was hoping we'd get to see some of the new toys that they're introducing in this sequel, but I guess not. Despite all that, this is still a really cool first look photo, especially for fans of Pixar or Toy Story. This is definitely going to be one of the highlights of next summer and I can't wait to see the next trailer they release. I love Pixar! Woody, Buzz, and the rest of their toy-box friends are all dumped in a day-care center after their owner, Andy, departs for college. Tom Hanks, Tim Allen, Joan Cusack, and John Ratzenberger will all be back. Toy Story 3 is being directed by Lee Unkrich, another one of Pixar's creative masterminds who previously co-directed Toy Story 2, Monsters, Inc., and Finding Nemo. The screenplay was written by Michael Arndt, the Oscar winning screenwriter of Little Miss Sunshine who is a newcomer to the Pixar family. 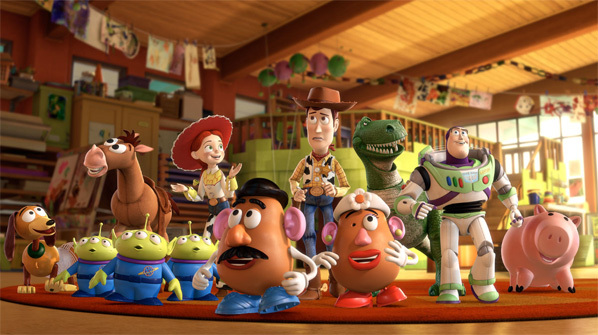 Disney is bringing Pixar's Toy Story 3 to theaters everywhere in digital 3D starting on June 18th, 2010 next year. I love these cartoons, even at the age of 29, thanks for sharing. They really are stepping up the cinematography year over year - especially having seen the double feature in Oct.
where's Bo Peep? and R.C.? AND WHERE'S MRS. POTATOHEAD'S EYE!!!! Did Mr. Potatohead hit her again? WHERE THE HELL IS BO PEEP?!!!! spousal abuse can be funny sometimes...But not all the time. CANNOT WAIT!!!! even willing to keep my disdain for 3-D in check for this one. AWESOMEEEEEEEEE!!!! well Bo Beep didnt really have a huge role in any of the toy stories when u think about it....she was just in the scenes to kiss woody at the beginning and end and pretty much u forget she's even there everywhere in between... anyway y do u guys think woody and the 3 lil martians are the only ones freaked out in the pic? I like these cartoon age the age of 19, thank you for sharing this, great post!